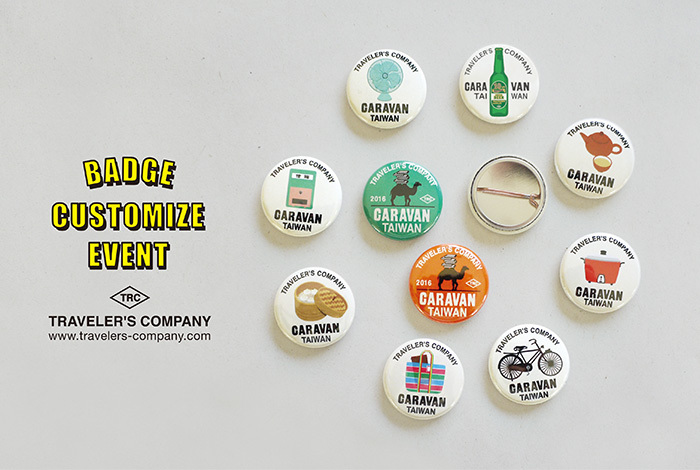 TRAVELER’S COMPANY – a group making products including TRAVELER’S notebook that makes people travel through their daily lives – will travel again as a caravan. This time, the destination will be Taiwan. 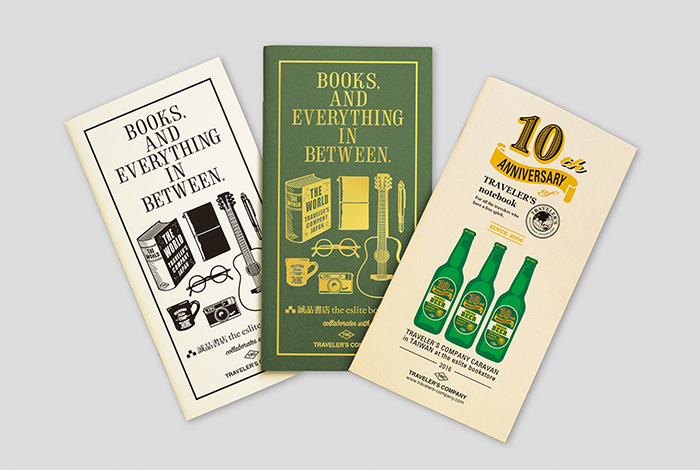 Starting from Friday April 15, there will be a special corner featuring the 10th anniversary of TRAVELER’S notebook at eslite bookstore Xinyi store. eslite bookstore is a bookstore based in Taiwan, and has a high reputation for releasing a unique culture. 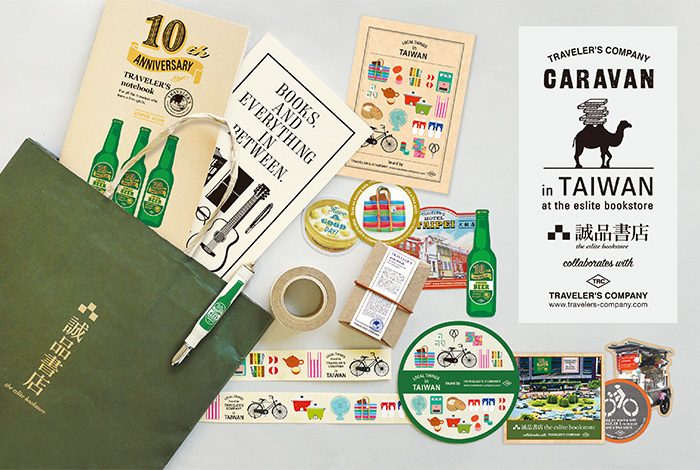 Items related to TRAVELER’S notebook including the limited TRAVELER’S notebook Mini 10th Anniversary Can Set, a pop-up store of TRAVELER’S FACTORY, an exhibition showing 10 years of history of TRAVELER’S notebook, notebook customizing corner including stamps, and to celebrate this event, limited version of masking tapes and Passport Size refills with images of Taiwan will be prepared. Also, there will be limited collaboration items with eslite bookstore where notebook refills, brass ballpoint pen, brass tag, stickers, and other items will be released. Also, customers who purchased more than 1,000 TWD will receive a limited original badge. This will be given on a first-come-first-served basis. On Saturday April 16 and Sunday April 17, the Spiral Ring Notebook Event will be held in Taiwan for the first time. 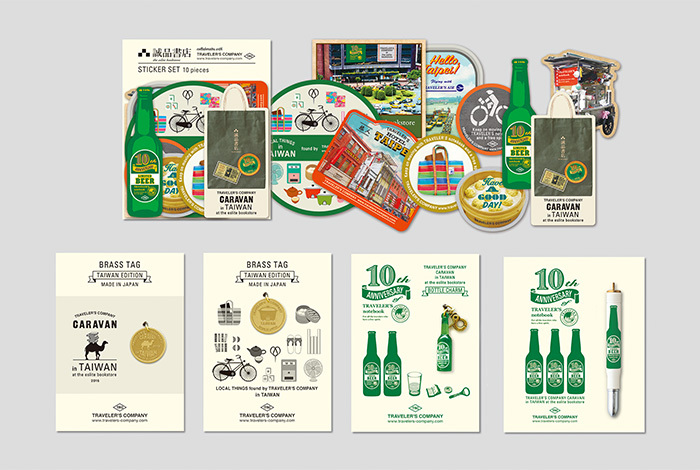 The 10th Anniversary Special Corner will be held until May 1, but the pop-up store of TRAVELER’S FACTORY and limited items of Taiwan will be available until May 15. In Taiwan, there are a lot of shops that treat TRAVELER’S notebook with care and respect, and there are a lot of good foods and heartwarming people, making it an attractive place to travel. It would be a pleasure for us if people could use this opportunity to travel Taiwan and join this event. *The detail of Taiwan limited products will be informed soon. In this corner, 10 years of history of TRAVELER’S notebook, customizing corner, pop-up store of TRAVELER’S FACTORY will be placed, and 10th anniversary limited items, limited items for the Taiwan event, limited collaboration items with eslite bookstore, and other items will be sold. Customers who purchased more than 1,000 TWD will receive a limited original badge. This will be given on a first-come-first-served basis. 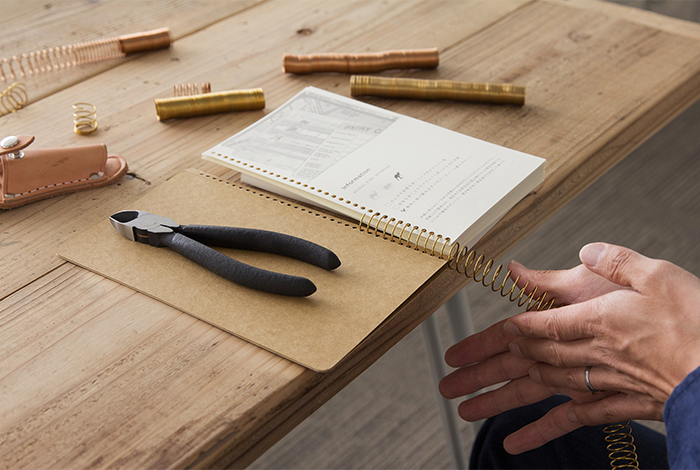 This is an event where people can make their one and only notebook. You can choose the original cover for Taiwan event. *In Japan, the limited items for the Taiwan event and limited collaboration items with eslite bookstore will be sold in TRAVELER’S FACTORY Nakameguro, TRAVELER’S FACTORY AIRPORT, and TRAVELER’S FACTORY ONLINE SHOP (The release date and details will be available on the TRAVELER’S FACTORY official website later). 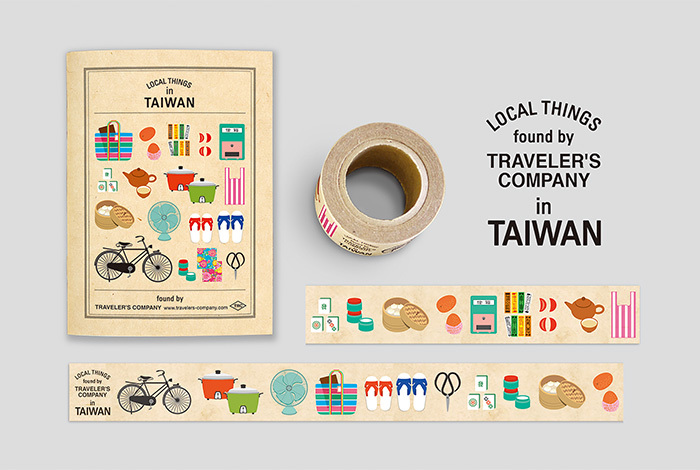 This is a masking tape and Passport Size refill with things found in Taiwan being applied. 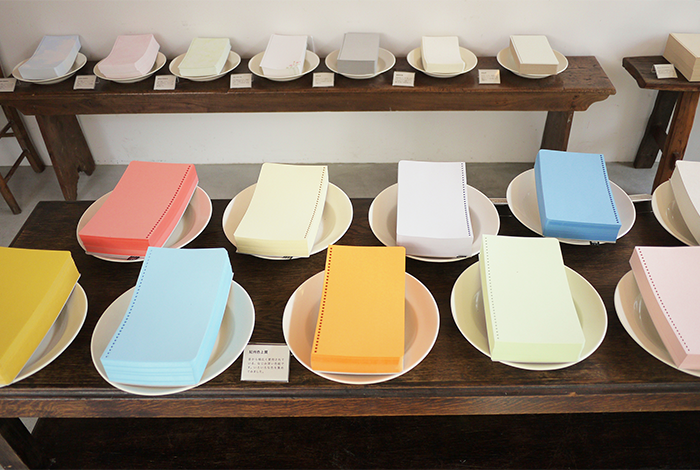 *Taiwan limited version of masking tapes and Passport Size refill will be sold at below shops. A brass tag celebrating the Taiwan Caravan Event, a charm and brass ballpoint pen giving cheers to celebrate the 10th anniversary, stickers that have the image of things seen in Taiwan and eslite bookstore, and other customizing items are available to create a Taiwan version TRAVELER’S notebook! This is a collaboration refill with eslite bookstore with the concept word of eslite bookstore “BOOKS, AND EVERYTHING IN BETWEEN” being applied and a 10th anniversary refill. This bag made of thick cotton fabric has a collaboration design being printed, and fits books perfectly. The smaller cotton bag fits TRAVELER’S notebook perfectly well. 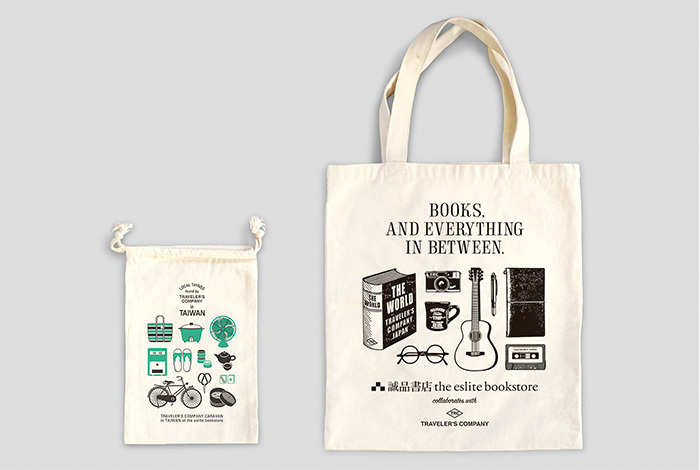 *The collaboration items with eslite bookstore will also be available in eslite bookstores other than Xinyi Store. Customers who purchased more than 1,000 TWD will receive a limited original badge. This will be given on a first-come-first-served basis.